Looking for something really warm for your little one? Our Parka is beautifully made, with a sind/water resistant outer shell and a thick Yukon fleece inner lining for maximum warmth. 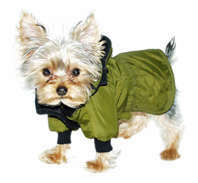 The Parka has cuffed sleeves, removable snap on, drawstring hood and front velcro closures.